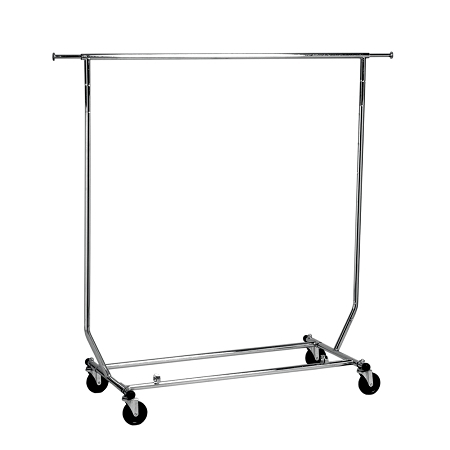 48" Long By 24" Wide But Can Be Folded To 52-1/2" By 22-1/2" By Only 3-1/2"
THE SINGLE BAR COLLAPSIBLE CHROME CLOTHING RACKS ARE GREAT STORE FIXTURES TO DISPLAY YOUR NEWEST FASHIONS. 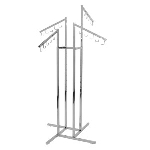 THIS STORE FIXTURE CLOTHING RACK IS GREAT TO DISPLAY SHIRTS, PANTS, COATS, DRESSES, AND MORE. THIS COLLAPSIBLE CLOTHING RACK CAN BE USED FOR RESIDENTIAL AND COMMERCIAL USE. 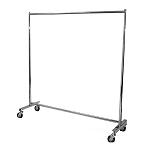 THIS CLOTHING RACK IS VERY POPULAR FOR TRADE SHOWS, CRAFT SHOWS, AND OTHER EVENTS. THE COLLAPSIBLE RACK CAN ALSO BE USED FOR RETAIL STORES TO DISPLAY SEASONAL FASHIONS THAT HAVE A LIMITED DISPLAY LIFE. 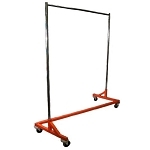 THIS SINGLE BAR COLLAPSIBLE CLOTHING RACK IS 48" LONG BUT CAN BE EXTENDED UP TO 72 INCHES BY EXTENDING THE 12" LONG PULL OUT RAILS FROM EACH SIDE. HAS AN ADJUSTABLE HEIGHT RANGING FROM 55" TO 65" TALL IN 5" INCREMENTS. 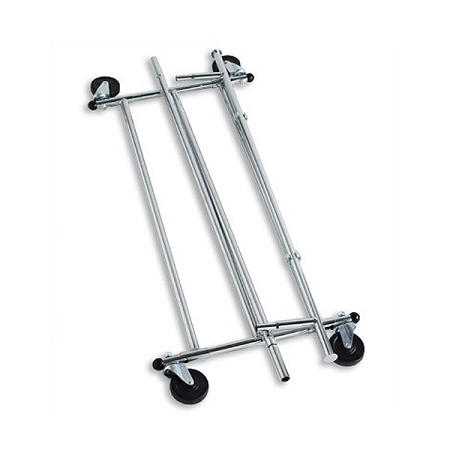 THIS BEAUTIFUL CLOTHING RACK COMES WITH FOUR CASTERS FOR EASY MOBILITY. THIS COLLAPSIBLE RACK CAN FOLD DOWN IN 3 EASY STEPS IN JUST SECONDS FOR EASY TRANSPORTATION. THE COLLAPSIBLE GARMENT RACK CAN BE FOLDED DOWN TO 52-1/2" BY 22-1/2" BY ONLY 3-1/2" TALL FOR EASY STORAGE IN CLOSETS OR STORAGE ROOMS.